Check out Tobi's Skyler Striped Velvet Bodysuit Who doesn't love a bodysuit? With 3/4 length sleeves, the Black Skyler Striped Velvet Bodysuit is a handy bodysuit to have around for layering, but in ribbed velvet with a deep plunge neckline, it becomes something altogether sexier. Pair this long sleeve vneck bodysuit with a mini and heeled booties to show it off. Who doesn't love a bodysuit? 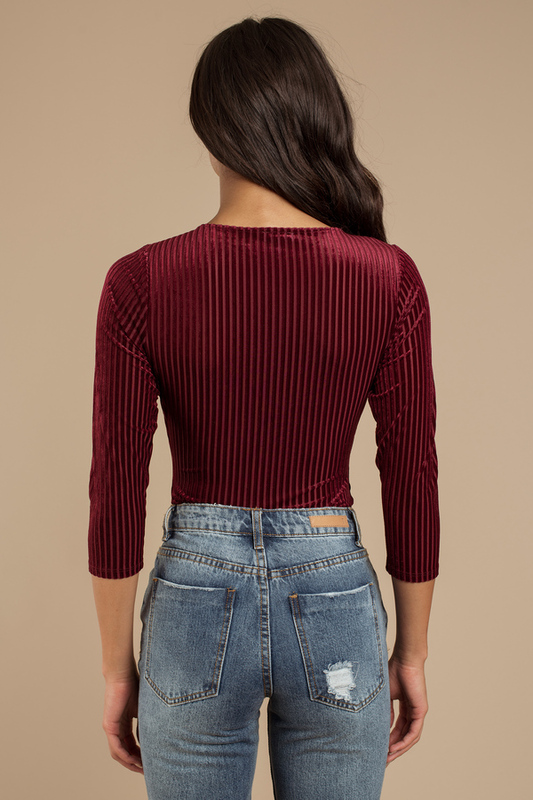 With 3/4 length sleeves, the Wine Skyler Striped Velvet Bodysuit is a handy bodysuit to have around for layering, but in ribbed velvet with a deep plunge neckline, it becomes something altogether sexier. Pair this long sleeve vneck bodysuit with a mini and heeled booties to show it off. Who doesn't love a bodysuit? With 3/4 length sleeves, the Black Skyler Striped Velvet Bodysuit is a handy bodysuit to have around for layering, but in ribbed velvet with a deep plunge neckline, it becomes something altogether sexier. Pair this long sleeve vneck bodysuit with a mini and heeled booties to show it off.